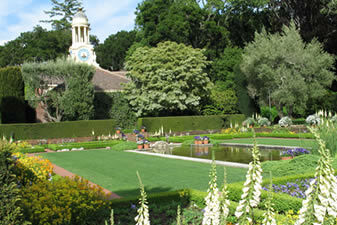 The only mournful thing about the music that follows is that it’s the last set of two divine concerts by this happy group — Rossano and Stephanie, piano; Nicki, vocal and string bass; Hal, drums — that took place at Dominican University, San Rafael (July 28) and at extraordinary Filoli, Woodside (July 29). Now, who among us will begin to book the global concert tour for this group? They and the rest of the world surely deserve it. We expect that someone’s speaking voice is immediately identifiable, a personal signature. But it seems magical that a pianist, seated at a complex of wires and wooden hammers, does the same thing in a few notes. 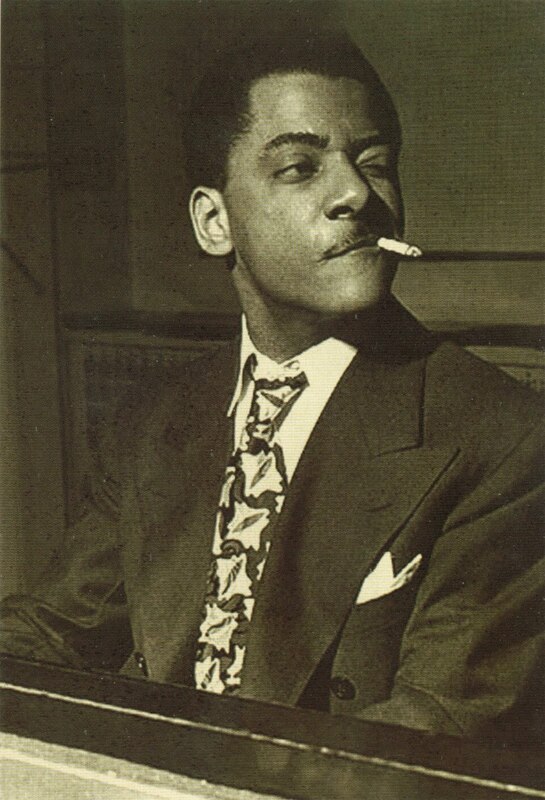 Teddy Wilson is one of those masters; there’s no mistaking him. Each of us who has been listening to jazz for more than a few years has a kind of mental iPod (some will imagine a jukebox) of music first heard decades ago that stays in the mind. Wilson’s 1938 solo performance of I’LL SEE YOU IN MY DREAMS is a favorite touchstone — ever since I first encountered a 10″ lp on the bootleg Jolly Roger label in a New York secondhand shop — a series of otherwise unidentified Wilson solos I knew nothing of at the time. How does he make the piano sound so clearly an extension of himself? Pianists will speak of the individual instrument, the player’s physical approach to the keys and pedals, of chord voicings and note choices, of Wilson’s ringing treble lines and mixture of walking tenths and stride bass — all matters I understand in a rather indefinite way. All of that is true, but there always is something mystical in the relations between player and instrument, deep and elusive. One can attempt to copy a Wilson transcription by playing the notes off of the page and the result will not sound like him. I heard Teddy in ten or twelve different settings live between 1972 and 1981: at the overamplified Carnegie Hall piano; outdoors at a Suffolk County airport; in a suburban shopping mall; in Radio City Music Hall: he sounded like himself, no matter where you put him. This solo is even more remarkable to me because it was originally intended as a way for Wilson to teach people how to play in his style — by correspondence. (He had become much more famous through his appearances and recordings with Goodman, Holiday, and others, and I am happy that he entered into this business venture, for it left such lovely evidence behind.) 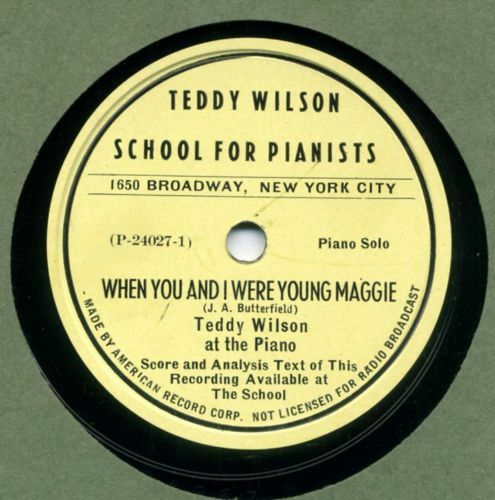 In 1938, one could enroll as a student in the Teddy Wilson School for Pianists, its headquarters at 1650 Broadway, and for some fee (I wish I knew how much it cost) receive printed instruction sheets and commentary on piano solo recordings. I note that the label says “Score and analysis text” available at the school: does anyone possess the transcriptions of these performances? But the music is what counts. Wilson had mastered the great paradox: his playing sounds calm, unhurried, but his lines that push forward with a quiet rhythmic intensity. And a Wilson performance at a slow or medium tempo has some of the same false ease one experiences while listening to Bing Crosby: an optimistic listener thinks, “That doesn’t sound too hard. With a few lessons, I could do that, too.” But the goal is elusive. I’ve tried to reproduce some version of the four-bar introduction by playing the recording and then going to the piano: its easy translucency is not easily reproduced. Wilson clearly learned a good deal from Louis and Hines, from Fats and the great horn players — but there’s a classical reserve in his playing, a translucency that I think comes from playing Bach and Chopin: knowing how to make simple melodies come alive, to make notes ring. There’s nothing formulaic or mechanical in this performance, even though he had chosen a simpler-than-usual approach in the first two choruses, saving some complexities for the final one. His rhythms pulsate; even the most formal statement of the melody swings; the interplay between his left-hand harmonies and his melodic inventions is something to marvel at. And although the performance is a sterling example of “keeping time” — it never accelerates or drags — Wilson’s rubato hesitations and suspensions at unexpected moments keep it flexible and full of surprises, even when the surprises are understated. I think of 1938 — hardly a year for global optimism — as a time when people actually wanted to study Teddy Wilson’s piano improvisations. That speaks of an idyllic past, perhaps lost. But we can still hear Teddy Wilson in our dreams. Someone should really acknowledge the passing of John Bunch. He was a truly unique stylist and a brilliant improviser. I remember listening with awe once as he played multiple choruses on the blues, every one taking up a new idea and developing it through each 12-bar sequence without being the slightest bit pedantic. I thought I was listening to the spontaneous creation of a 20th Century Goldberg Variations. John had a all the qualities of a great player – originality, flawless technique (which never called attention to itself), great subtlety, and infectious swing. All he lacked was the major recognition, partly because his personality was very much like his playing: no flash or gimmicks. Also, perhaps because he was identified as a “mainstream” player, which signifies lack of originality in critical parlance. But as Harry Allen once said, John was always the most modern (and timeless I would add) player on the bandstand. Nate Chinen’s piece in the NY Times was respectful and accurate to a point, but again, it implied that John was a “swing” player (there’s that word again). John’s conception began with bebop, and his whole approach (rhythm, harmonic, melodic) was much more in the Hank Jones school than Teddy Wilson, though again, he spoke unequivocally in his own voice. John will be sorely missed by those who knew him and those who revered his playing. Like any true artist, he leaves a void that cannot be filled. I can only add that I first saw and heard John play with Ruby Braff in the early Seventies. In retrospect, I was so awed by Ruby’s playing that it took some time for me to actually hear closely what John was consistently, quietly doing. But I can still see and hear Ruby standing by the piano while John soloed, urging him on, agreeing, smiling at what he heard. In a musical landscape of extroverts and self-dramatizers, John pursued his art — serenely and thoughtfully, with wonderful swing and understated eloquence. In my experience, certain musicians, now gone, were always reliable and more: seeing them onstage, I could relax, knowing that the music was going to be superb. Jake Hanna, George Duvivier, Milt Hinton, John Bunch. We are fortunate to have heard them, to have been welcomed into their individual rooms.